"Pieds-noirs" (sometimes written "pieds noirs"), lit. "black-foot", is the name given to the colonists of French nationality who lived in Algeria before the independence, and, mostly, to those of them repatriated (known in French as rapatriés) after the independence. The name "pied-noir" does not seem to have been widely used before 1955. Moreover, in the beginning of the 20th century, "pied-noir" was used to designate the firemen of steam ships, who mostly worked with bare feet coloured in black by coal, and Arabs of Algeria, since most firemen at that time were Algerian Arabs [Grand Robert de la Littérature Française]. Before the troubles that preceded the independence of Algeria, the colonists' community of Algeria did not use a specific name but "Algerians" or "Northern Africans", calling the natives "Arabs" or "Muslims". The Muslims who remained faithful to France are not called "pieds-noirs" but "harkis". In 1959, there were some 1,025,000 pieds-noirs in Algeria. Between spring and September 1962, some 900,000 of them, feeling abandoned and betrayed by the French government, especially by General de Gaulle, during the preparation of independence, left Algeria to France in quite chaotic conditions. The government, expecting only 200,000-300,000 temporary rapatriés, did very little to help the newcomers, most of them having never been to continental France before and having no relatives there. The massive input of these people caused significant resentment in France, the pieds-noirs being considered as responsible of the defeat. Most pieds-noirs belonged to the lower classes (workers, shop owners); they suffered more from the war, getting very low compensation, if any, from the French government for their lost goods, than they had supported it. However, they quickly showed their skills and solidarity and became famous as hard workers, accepting jobs that nobody else would have cared to do. Their contribution of the development of France in the 1960-1970s has been widely recognized, especially in the big towns of the south of France, such as Nice, Montpellier, Perpignan, Toulon and, most of all, Marseilles. The need to house all these people partially explain the swift urbanization of the Mediterranean coast and its negative consequences for the environment. The pied-noir community is today fully "integrated" to the French society, which is not at all the case of the "harkis". While considering themselves as French, and being legally so - Algeria was not part of the colonial Empire but made of departments with the same status as the continental ones - the pieds noirs have developed in Algeria their own culture. After the repatriation, they have proudly preserved their immediatly recognizable accent and idiomatic language, called pataouète, and fed with Catalan, Spanish, Italian, Arab and Provencal roots, reflecting the diversity of the pied-noir population. There were significant local differences, for instance the region of Oran was mostly inhabited by pieds-noirs of Spanish origin while the eastern part of Algeria was mostly under Italian influence. The popular heritage of the pieds-noirs has been illustrated by several humorists and actors, such as the duo Robert Castel (b. 1933) and Lucette Sahuquet (1926-1987) and Marthe Villalonga (b. 1932). Playing with stereotypes (the pied-noir couple, the Jewish mother...), these artists have often been scorned exactly as the pieds-noirs had been in the 1960s, considered as naive, noisy and ignorant people, not really worth being welcomed in France. In a more subtle way, with much less stereotypes, Alex Métayer (1930-2004) has developed a very personal re-enaction of the life in Algeria, often plyaing all the characters in his shows, from the great- great mother to the Jewish musicians singing "My funny Valentine" with an incredible pied-noir accent. Even more famous, Guy Bedos (b. 1934) has concealed his pied-noir roots in most of his shows, but they are still there; during the War of Algeria, he refused to take the arms "against his brothers" and produced the show Coup de soleil (Sunburst) on ther eve of the First Gulf War, featuring "the Arab" Smaïn (b. 1958) and "the Jew" Michel Boujenah (b. 1952). Another emblematic defender of the pied-noir heritage is the singer, guitarist and peace militant Enrico Macias (b. 1938 to a Jewish family in Constantine). The athlet Alain Mimoun (1921-2013), winner of the marathon in the 1956 Olympics (Melbourne) and famous for his friendly rivalry with Emil Zátopek, and since then a kind of national hero, is probably the most emblematic pied-noir of "lower" origin. However, Algeria and especially Algiers, was also a hotspot of culture, for instance during the Second World War. The writers and philosophers Albert Camus (1913-1960, awarded the Nobel Prize in Literature in 1957), Louis Althusser (1918-1990, the "pope" of structural marxism), Emmanuel Roblès (1914-1995) and Jacques Derrida (1930-2004, the founder of deconstruction) were all pieds-noirs. A sizeable part of the pied-noir community did not accept the independence of Algeria and its sad consequences for them and turned into a very revendicative fraction, especially in the south of France. These people were lured by xenophobic parties such as Front National, which considered them as a potential reservoir of votes. Very visible in the media, the radical pieds-noirs contributed to the image of the pieds-noirs, as a whole community, as racist people, while most of them are not. The pieds-noirs have formed several associations, some of them actively supporting radical positions, other asking for the recognition of their culture and heritage and the compensation of their losses in Algeria, a case still not fully resolved. There is no flag representing the whole pied-noir community and widely used by them. This seems logic since the pieds-noirs first defined themselves as French and cherish the French national flag; moreover, their wide political and geographical scattering prevent them to appear as a united community. While several pieds-noirs are involved in politics, the few attempts to set up a specific pied-noir party all failed. 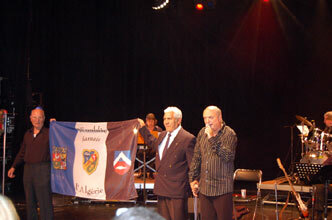 The Parti Pied-Noir (PPN), founded in 1999 by André Cherid (d. 2007) never reached any national and even local visibility. Pieds-noirs often use a French Tricolor flag with two black feet placed either vertically (photo, 1 November 2007) or horizontally (photo of unknown origin). The two black feet are used on several websites as a pied-noir symbol, sometimes placed on a Tricolor background. There are cloth patches and insignia with this design but there are very few evidence of real flags. For instance, ADPN (Association Diffusion Pied Noir; website) uses posters with a French Tricolore flag charged with two black feet placed vertically inside a white heart bordered in black. A drapeau des Français d'Algérie has been designed by the singer Jean-Paul Gavino (biography), a representative of the radical trend of the pied-noir community. The flag (photo is vertically divided blue-white-black. Blue represents the Mediterranean Sea, white the white towns of Algeria, and black the pain of mourning and exile. The coats of arms of the three main towns of Algeria are placed in the middle of each stripe, respectively Oran, Algiers and Constantine. The motto N'oublie / jamais / l'Algérie (Never forget Algeria) is written in black letters in the white stripe. The flag is shown as square but is indeed sold in three sizes with proportions 2:3 (30 x 45 cm; 80 x 120 cm; 100 x 150 cm). Oran, allegedly founded by Andalous seamen in 902, was fiercely disputed between the Spaniards and the Beys of Mascara, who settled there in 1792 and were expelled by the French on 4 January 1831. The Spanish heritage of Oran also contributed to the design of the municipal arms. In 1921, Captain Baudin sent a letter to the editor of L Écho d'Oran, exposing the inconsistency in the representation of the arms in different places of the town. It seems that the "official" arms of Oran were those painted on the ceiling of the meeting room of the Town Hall, but that the Municipal Council had never discussed arms nor adopted any. The inconsistency was solved only on 29 May 1936, when the Municipal Council officially adopted arms based on the painting of the town hall's ceiling. The greater arms of the town, as represented on Gavino's flag, were designed by the "official" heraldist Robert Louis and adopted by the Municipal Council on 6 May 1960, with the following blason: "Quarterly 1. Gules a rooster argent the dexter foot on a ball or, 2. Z nave antique sable, a lion's head in prow and sails argent, with an ensign of France modern, sailing on a sea wavy argent and azure, 3. Vert a crescent or surmounted by a mullet of the same, 4. Quarterly, 1. and 4. Gules a tower or, 2. and 3. Argent a lion gules, a chief azure semy of fleurs-de-lis or. Ornaments: The shield topped by a five-towers mural crown [...] masoned sable, is supported by two lions armed and langued gules [...]." The quarters represent the stages in the history of the town: the French conquest (the rooster and the chief of France), the maritime origin of the town (with a very anachronic French tricolore flag over the Andalous ship), the Muslim period and the Spanish period (arms of Castile and León). The arms of Algiers were adopted by the Municipal Council on 10 February 1862, after a coat of arms painted on the wall of the former Gate of the Marine, discovered on 5 July 1830 during the seizure of the town by the French. The so-called Byzantine, heart- shaped shield was kept and a Latin cross was added to the existing crescent and lion. The coat of arms is blazoned as: "Per bend sinister azure and vert, a bend sinister or all over in chief an escutcheon gules a Latin cross argent in base a lion contourned proper the dexter forepaw on a ball of the same. The bend sinister azure charged in chief dexter with a nave with sails argent contourned supported by a crescent of the same. The bend sinister vert charged per bend sinsiter with a garb banded or. The whole shield fimbriated or. Ornaments: The shield topped by a five-towers mural crown or [...], the towers roofed by a dome topped with a crescent, all or. The shield placed on radiating leaves of phenix argent in base a band azure. The War Cross 1939-1945 appended in base of the shield [Mention in Dispatches, Decisions #92, 11 November 1948]. The arms of Constantine are "Per fess azure and gules chevrony argent in base a fish of the same. The shield surmounted by a five-crenels mural crown charged with a horse rampant contourned sable." According to R. Le Viavant (De Cirta à Constantine de 1836 à 1962, ACEP Ensemble, Montpellier), azure represents the sky of Algeria, gules the desert or the gorges of oued (river) Rhumel, which were described by the writer Guy de Maupassant as "a chasm red as if the eternal flames had burned it." The chevron represents the confluency, upstream of Constantine, of oueds Rhumel and Bou Merzoug, and, maybe, the spurs of the Arab riders. The fish is a barbel, common in the Algerian oueds and representing the Rhumel. The mural crown states that Constantine is a town and represents also the antique town of Cirta. The black, Numidian horse represents the famous black mare Halilifa, which contributed to the lift of the siege of the town by the Tunisians in 1700. In the Armorial des Communes de l'Algérie Française, Nicolas Vernot and Jean-Paul Fernon point out that the original meaning of the arms of Constantine might have been blurred by the several variations observed in their representation. The date of adoption of the arms is unknown: the French municipality of Constantine was founded in 1854 and the coat of arms was placed on the facade of the town hall, built between 1895 and 1902. The authors of the Armorial believe that Le Viavant deliberately concealed the colonial meaning of the arms, since he forgot to mention that the arms use the French national colours and explicitely rejected the Christian symbolism of the fish. The arms indeed seem to include a topographic representation of Constantine, built on a spur (chevron) separating red gorges (field gules), dominating the Rhumel (field azure) rich in fishes. The chevron might also represent a oued confluency or curve, but the most salient feature of Constantine is its location on a spur. The fish has probably a Christian meaning intended to add legitimity to the first colonists, recalling also that Constantine the Great, after whom the town was named, was the first Christian Roman Emperor. The Arab riders are recalled more by the horse than by the chevron; the Halilifa mare indeed allowed her rider to escape from the besieged town and ride to Algiers to get help. Another possible explanation for the horse is the local stud farm. The arms of Constantine were redrawn by Robert Louis in 1947. CDBAF (Comité du blason de l'Algérie française - Committee for the arms of French Algeria) was established in June 2010 "to elaborate an emblem for the French province of Algeria and to offer it to all Pieds Noirs and their associations". A call for proposals was published in different newspapers and association's websites, yielding some 60 drawings and lists of symbols. The committee selected four proposals featuring the symbols and colors most proposed by the contributors, and further decided of a common chief, horizontally divided red-blue-white-red-blue and charged with three yellow fleurs-de-lis. The most voted of the four final proposals, registered with the Ministry of the Interior like the arms of the other French provinces, was placed on a French tricolor flag to compose the flag of French Algeria. The arms are "Quarterly, 1. Gules a sun or, 2. Azure a ship argent the sail charged with two feet sable flying a Tricolor pennant at the mainmast on waves azure and argent, 3. Azure a bend sinister argent charged with a crescent vert a Shield of David azure and a Latin cross gules, 4. Gules a bunch of grapes or in base a wheat spike or and a branch of olive proper fructed sable crossed per saltire. A chief argent two fesses per fess gules and azure three fleurs-de-lis or". The shield is surmounted by a scroll argent inscribed "1830 ALGERIA NOSTRA 1962", the dates gules and the writing brunâtre. The shield is surrounded by two palms crossed in saltire by a knot argent and charged with a scroll argent inscribed "TU SERAS FIDÈLE AUX TIENS". The 1st quarter features the ardent and generous sun. The 2nd quarter features the ship that brought in and back the Pieds Noirs, represented by their emblem on the sail. The 3rd quarter features the emblem of the three religions that coexisted in Algeria. The 4th quarter features the symbols of development of the country, grapevine, wheat and olive. The dates recall the French conquest and abandon of Algeria, respectively. The Latin writing reads "Our Algeria", maybe a reminiscence of the Latin name of the Mediterranean Sea, "Mare Nostrum" (Our Sea). The French motto reads "You Shall Be Loyal To Yours".